At the end of February, Facebook introduced the Timeline layout for personal profile pages. Now that the Timeline layout is set to roll out for Facebook business pages on March 30, it's important to prepare your brand for the changes. The new presentation emphasizes chronological history, with the Timeline extending back to when the business first started using Facebook or back to the beginning of the business--well over 100 years for a company like Coca-Cola. The design also features a large cover-photo area, allowing for new, creative ways to show off your business visually. As with most Facebook changes, users are divided as to whether they like the new features. 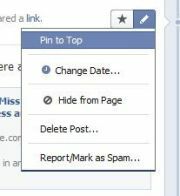 On the positive side, Timeline will allow page administrators to highlight and pin posts to emphasize certain content. Using the cover photo creatively may increase fan engagement. And private messaging opens the doors wider for customer communication. One big shift that Timeline brings to companies is the loss of the former layout's default landing tab, which helped you grow your page's fan base with marketing and promotional efforts. With Timeline you can still interact with users, but in my view it will become harder to convert users to customers or brand advocates. A bakery uses Timeline to show off its treats. Do some planning before creating your page, including choosing images and apps, and developing a strategy for growing your fan base. These days it's more important to keep your page updated frequently, and to consider Facebook advertising. To start a new Facebook page, first click the Create a Page link. Next, fill out the various fields and agree to Facebook's terms of service. After clicking the Get Started button, you need to upload a profile photo, add information about your business, and choose your Facebook page address. Then you can start inviting friends and working with the new Admin Panel. If you already have a Facebook business page, when you sign in Facebook will likely display a prompt about how to get started with the Timeline layout, so follow those steps. First off, add a cover photo to your page, expressing in an 851-by-315-pixel image what your company is about. Facebook bars these images from containing price or purchase information, contact information, references to Facebook features such as Like and Share, and any calls to action ("Tell your friends” and such). The About section becomes more prominent, so fill it well. The About section contains the same information as in the previous layout but stands out more prominently, so be sure to complete this portion. You likely filled in this content during the page-setup process, but you can still modify it by clicking the Admin Panel button. Select the Manage drop-down menu and then choose Edit Page. On the Edit Page screen, select Basic Information to edit the About information. Application boxes give you a way to add interactivity to your page, similar to the Facebook tabs from the older page layout. Each box links to an app you've installed on your page. Though the top row offers four boxes, the one for Photos is fixed, so you have just three to work with there. Among the dozen boxes total, eight are visible only when the visitor clicks the down arrow next to the top four app boxes. Visitors click apps boxes to access apps you've installed. You can add a custom, 110-by-74-pixel image to represent your app box. Click the down arrow to the right of the apps boxes to open the ones that aren't immediately displayed. Hover over the box that you want to change, and a pencil icon appears. Click that icon to edit, and then select Edit Settings for a dialog box that will allow you to remove the application box, rename it, or change the custom image. Here's where you edit the apps boxes. 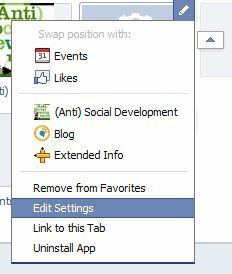 Clicking Change opens a new Facebook window. Within the new browser window will be your current image, plus another link called Change. Click the link and upload the new image. If you go back to the original browser window, you'll see the updated image. You can move app boxes around by hovering over an app box, clicking the pencil icon, and selecting the application that you would like to swap positions with. You can also remove an app completely. If you create a custom Facebook page, it will appear in one of these application boxes, so you will want to use an image and box order that display it prominently. You still can create custom Facebook pages via iframes coding or with third-party applications such as Pagemodo, but the procedure involves a few key changes. Previously, a custom page tab could not be more than 520 pixels wide. Now, a Timeline custom page can be 810 pixels wide. If you already have a custom page at the smaller width, Facebook will center the content in the 810-pixel space, so you don't have to update the page immediately. Regardless, the change in width is good, because it gives you a lot more space to create a unique design. Now you can pin selected content to the top of your Timeline wall. Unfortunately, Timeline will not allow you to set a default landing tab, so all visitors will go immediately to your Wall. Previously, you could set a custom page as the default landing tab for all new visitors, a useful way to present information about your company or promotions. 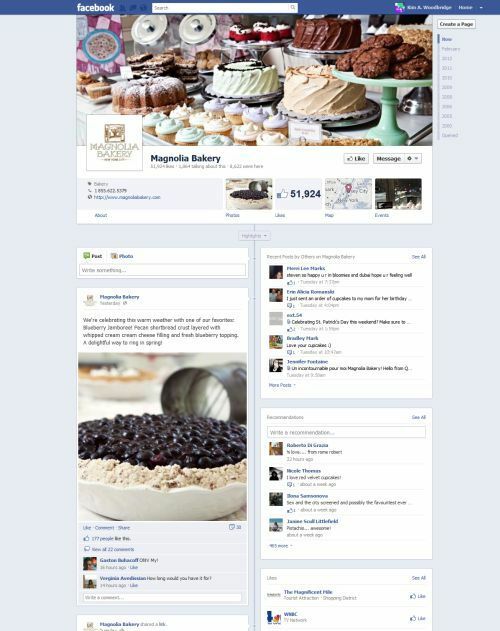 Instead, Facebook wants businesses to make a Wall post about their custom page or offer. Since a Wall post doesn't stay at the top of the page for long, you'll want to use a new feature called pinning. You can pin a post to the top of your Wall for up to seven days. This is now the best way to highlight a custom page, a sweepstakes, or a special offer. Just select a post, hover over the top right, click the pencil icon, and select Pin to Top. If you want to include a link to your custom tab application, click the pencil icon to edit, and select Link to this Tab. The link appears in a dialog box, and you can copy and paste it into your Wall post. Posts by your page visitors appear in a distinct section rather than on the Wall. In addition to pinning and linking, you can highlight a Wall post. This action makes the post appear full width rather than showing in only one of the two page columns. Highlight a post by hovering over the top-right corner and clicking the star icon. Fans can now send a private message to your business via the Message button. You can turn on messaging by going to the Admin Panel, selecting Manage, Edit Page, and checking the Messages box on the Manage Permissions page. I wouldn't recommend turning this feature off unless you are already managing customer feedback in another location and don't have the resources to manage this function via Facebook as well. You can check messages via the Admin Panel. Posts by visitors no longer intermingle with your Wall posts; now, a block to the right contains all of the recent posts from other users. Since the posts are less prominent in this location, it's important to remember to check them so that you don't miss any important messages or feedback from potential customers. Check the Activity Log for what's posted on your page. In the Activity Log, you can see everything that is being posted on your page, as well as moderate, edit, highlight, and delete content. It is available under Manage, Use Activity Log. Select the circle icon to the right of any post to edit it. Milestones, another new Timeline feature, let you add past events related to the history of your organization. To start using it, select Milestones where you enter a new Wall post, and add the date your business was founded. Next, you can include important past events that deserve a place on the Timeline. Timeline's new Admin Panel facilitates page management and includes five sections: Notifications, Messages, New Likes, Insights, and Page Tips. Some of these sections are familiar from earlier Facebook layouts, and are merely now available in one location. Messages, as described earlier, is the new area in which any private messages from visitors appear, and it will be available only if you've activated that feature. Page Tips is also new, but it's less useful, as it rotates through a variety of topics rather than offering a method of answering a specific question. Options for page admins have changed. You can access Insights via the See All link next to the Insights block in the Admin Panel. It remains the same, with four content areas: Overview, Likes, Reach, and Talking About This. The Overview page shows the total number of "Likes" for the page, the number of friends your fans have, the number of people talking about the page, and the weekly total reach. The bottom part of Overview is the Page Posts section, which shows the reach, the number of engaged users, the number of people talking about your page, and the "virality" of your page posts. Clicking any of the data items in the Page Posts section brings up a pop-up chart with more data about that post. In all sections of Insights, you can select a date range to obtain data for a specific time period. 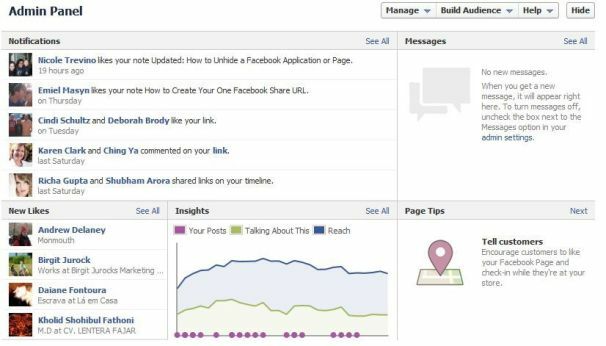 The Insights Likes tab shows the demographics and location of people who have liked your page, as well as where the Likes originated--such as the from the actual page, a Like box, or a mobile device. The Reach tab includes data about everyone who saw your content, even nonfans. It contains demographics, how they reached your page, page views, unique visitors, total tab views, and external sites that referred visitors to your page. 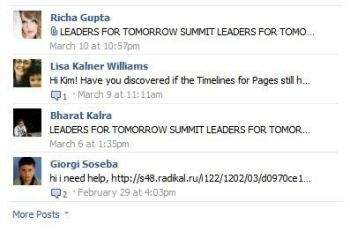 The Talking About This tab provides more details about who created a "story" about your page. This information includes the demographics as well as the viral reach of your content that was shared. Demographic data for this tab is available only when more than 30 people were talking about the page in the seven days preceding the last day of the selected date range. 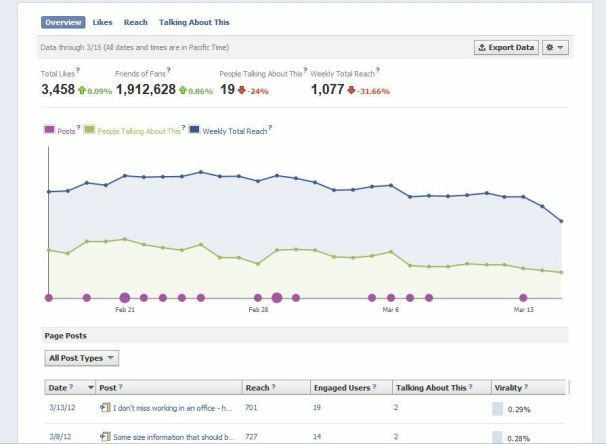 You'll still see trends in activity on your page within Insights. From the Manage menu at the top of the Admin Panel, you can access several options: Edit Page, Use Activity Log, and See Banned Users. 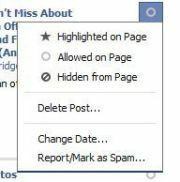 This same menu also allows you to toggle between using Facebook under your company/brand name (posting as the page admin) and using it under your personal name (posting as yourself). Edit Page contains all of the settings that were previously available via the Edit Page button on the old profile, such as Manage Permissions, Manage Admins, and Apps. As mentioned earlier, you can no longer set a default landing tab for new visitors to the page. When working with your page, Manage will be the area you use most, so it is important to become familiar with it. Build Audience, also at the top of the Admin Panel, is the section that will assist in growing your Facebook page's audience. Here you have several options: Invite Email Contacts, Invite Friends, Share the Page, and Create a Facebook Ad. The Help and Learning Video section is useful if you have specific Timeline questions or would like to take a tutorial. With the arrival of Timeline, Facebook Ads become more important for building an audience since you can no longer set a default landing tab to gain new fans. Once you get started, you can try Facebook's tutorial for more assistance. Advertising on Facebook can be an affordable way to increase the visibility of your business to other Facebook users. You can target the ad based on location, demographics, and interests. You can also set a budget to test the performance of your ad without creating a hefty expense. Once that budget is used up, your ad will no longer appear; if you wish, at that point you can add funds or decide not to use the ad anymore. You can set up ads in the Admin Panel via the Build Audience menu.